2011 ended with a great, relaxing holiday. 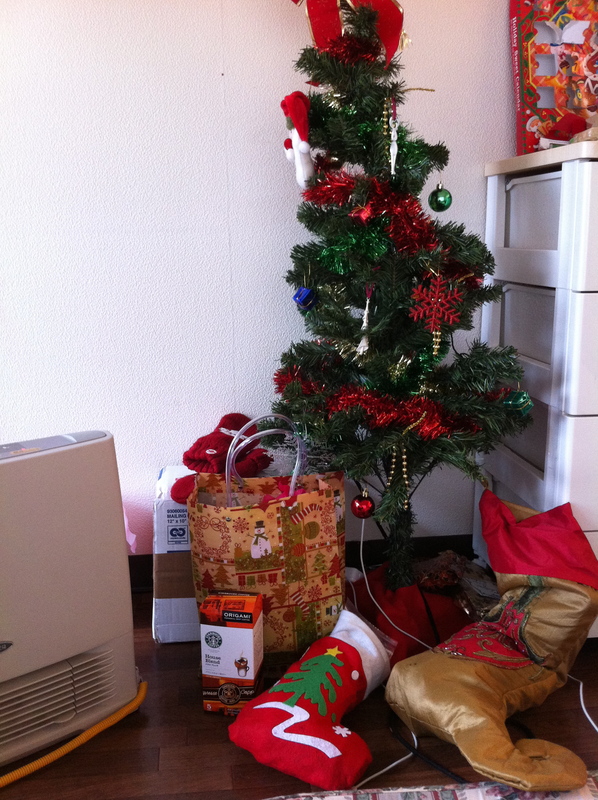 My dad arrived in Toyama on Christmas Eve. His plane landed about five minutes before the first big snowstorm of year began. It was a beautiful, white Christmas, with plenty of snow for Santa to land his sleigh. It didn’t really stop snowing for the three days that he visited. This was a bit unfortunate, as my dad was more than equipped for a Bangkok winter, but less so for a real, snowy winter. However, the unrelenting snow provided a great excuse to stay inside and eat lots and lots of bacon. (I also cooked a good Christmas dinner, but it was sandwiched in between bacon meals.) It was a low-key, but very fun visit. 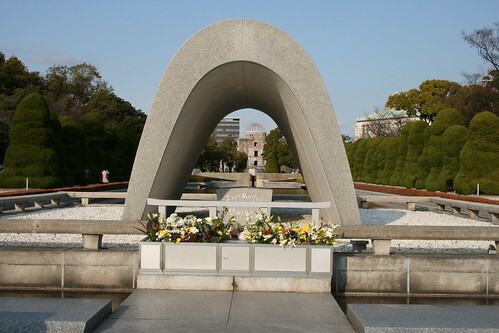 The day after my dad left, I took a short trip to Hiroshima. Although I was only gone for two nights, it was nice to get away from Toyama and hide in the (relative) anonymity of a big city. 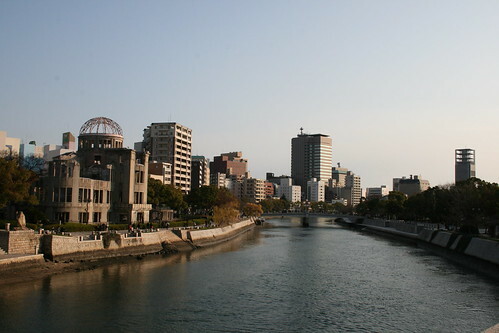 The A-Bomb Dome, surrounded by the rebuilt city of Hiroshima. The museums were all going to be closed from the 29th for the New Year’s holiday so the afternoon that I arrived I went straight to the Peace Memorial Museum, one of my main purposes for visiting the city. I wasn’t quite sure what to expect with the museum but I was pleasantly surprised. 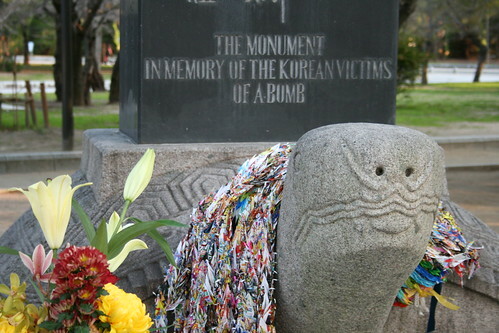 The Peace Museum examines the atrocities of the A-Bomb. It explains why the bomb was dropped at all, and why it was dropped on Hiroshima. It talks about the victims, those who died almost immediately and also the hibakusha, the victims who survived the bomb but then had to deal with the aftermath. It is not a feel-good topic. However, the museum is very much about promoting peace and getting rid of nuclear weaponry. While the stories in the museum are told from the perspective of a city that has survived a trauma, it does not encourage pointing fingers at specific countries. Instead, the exhibits drive home the sentiment that we are all citizens of the same planet and that we all need to work together to create peace. I was particularly impressed that the museum talks about the victims of the bomb not as Japanese per se, but as humans. It acknowledges that there were and are victims of many nationalities, including Koreans who working as forced labour. After I was finished in the museum I took advantage of the beautiful, sunny weather and walked around peace park. Like the museum, the park is full of monuments to the victims and messages of hope for the future. 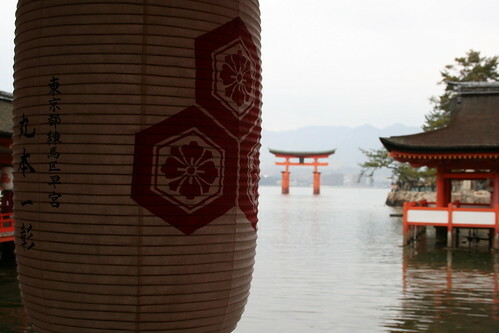 The next day I took the ferry out to Miyajima. 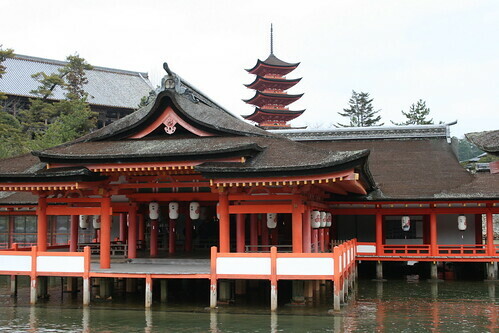 I am not going to go into great detail about Miyajima because I found it a bit… underwhelming. There are a lot of people who call Miyajima their favorite place in Japan, but I was less impressed. 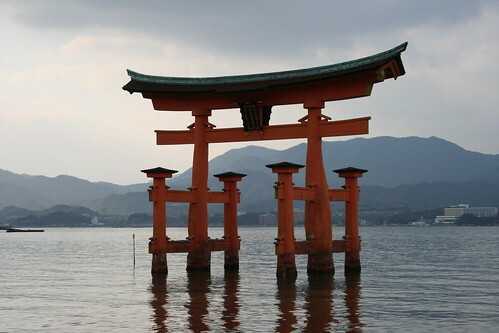 I was looking forward to seeing Itsukushima Shrine, which was designated a UNESCO World Heritage Site, partly for the way that the Shrine showcases human design working with nature. However, I felt like the way I was routed through the temple severely inhibited my ability to appreciate the architecture’s interactions with the natural setting. (Although I understand the need to have such a strict pathway, given how busy it must get at peak times.) Still, the temple and its torii gate were beautiful and it is always fun to see things in real life that have always seemed so impossibly foreign in pictures. All in all, I had a great week away from work but now it’s back to the grind! I hope everyone at home had a great holiday and here’s to a fantastic 2012!